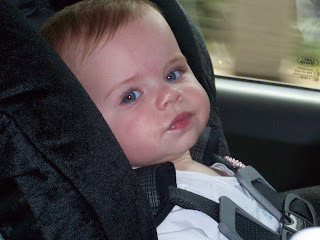 Ella (the babe that I nanny for) in Laguna Beach...she just had a little bite of a chocolate Malt! The last couple of weeks have been pretty crazy!! 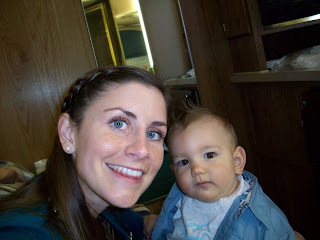 I was able to go to a taping of Dancing with the Stars to help watch my cousin Ashly's baby backstage. It was pretty cool to be able to see all the stars. It was the 100th episode so all of the past stars that have been on the show were back. I ran into Syesha from American Idol in the bathroom. It was right before she went on stage to preform. I hung out with Tom Bergeron and Samantha Harris(the hosts) in their dressing rooms and even was up close to Randy Jackson. They taped American Idol the same night so thats how I saw all of them. Then after the show at the Grove I ran into Kelly Kapoor from the Office! 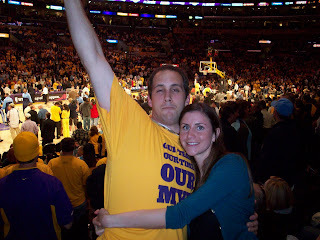 The next night we were able to go to a Lakers vs Jazz playoff game 8th row with our friends Matt and Carrie!! Denzel Washington was right in front of us along with Jack Black and Kelly Slater. We even got free T-shirts when we got to the game and I ended up selling mine for $20 bucks!! So we made money by going to the game. Then last weekend we went with Carrie and Matt to their beach house in Laguna Beach! 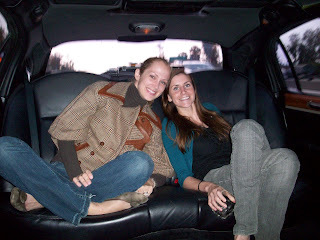 It was our first time in Laguna Beach and we had so much fun. They had a private beach and we had fun just walking around all the cool shops and eating yummy food. As you can see we are having a ton of fun here in LA!! So come and visit us! !